This tournament was on the 4th of December and used Crown And Sceptre. This tournament is on the 18th of December and has Queensbridge in the map pool. ASL will be using Demian SE 2.0 in the round of 16 and hopefully onwards. Date unconfirmed but the group stages of the tournament are running until atleast the 13th of December. The players include Flash, Bisu, Effort, Light, Sun, and very recently returned Stork, Jaedong, Soulkey. Also free, Movie, Best, Larva, Ample, Guemchi, force, Rush, MIsO, Terror, Mong and Hint. Season 10 of DRIT is using Queensbridge in the semifinal (if it goes to game 4 in a bo5) and in the final (game 4 of a bo7). Being played on Sunday December 4th and Sunday December 11th. 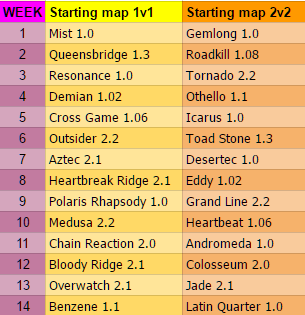 Starting maps include Gemlong, Queensbridge, Roadkill, Resonance, Demian, Cross Game, Toad Stone, Desertec, Eddy, Heartbeat, Overwatch, Latin Quarter. Tournament started on the 30th of October 2016 and will progress over 14 weeks.